Custom designed & developed to meet your needs. When we design and develop a website or web application, we make sure the entire process is hand-crafted to fit your specific needs. It’s what separates us from a lot of agencies out there. We don’t just buy a theme that does 1,000 different things and tweak it so it kinda, sorta does what you want. At the start, we sit down with you to make sure we fully understand your goals for the website, your brand, your anticipated users and your internal workflow. We believe every website should be beautiful and visually engaging, but ultimately web design is as much product design as it is graphic design. One of the most important concerns is “user experience,” as we call a person’s interaction with a website. The experience a person has interacting with your website is similar to the experience someone has when they visit your store or office. If it looks nice, but the service is poor, they probably won’t come back. Your website is simply another way you serve your customers. We put a strong focus on your users’ experience, so the website is easy for them to use and find their way around. We also work hard to understand your needs around updating and editing content, and integrating with other software you use inside your oranization — so we can create a website that uses the power of automation to save you time and effort. 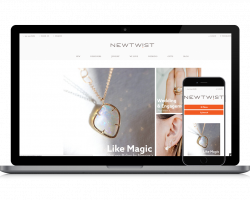 Web design is increasingly becoming “mobile-first.” That is, we often design the mobile views before we design the desktop views — or at least at the same time. If your website or web application doesn’t look right on a phone or tablet, you’re missing out on a huge potential audience. Almost 60 percent of Google searches now happen via mobile device — that’s from 2016. It’s probably even more now. Of course, that varies a bit by industry — people search for a restaurant on a mobile device a lot more often than they book an airline flight, for instance — but you should expect a significant piece of first-time traffic to the site to arrive via mobile device. And that’s likely to increase over time. What’s more, Google’s search algorithms appear to increasingly be favoring websites that perform well on mobile devices. 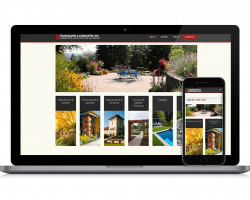 We build all of our sites following the principals of “responsive design,” which means your website reformats itself to look and function appropriately no matter the device it’s being viewed with — desktop, laptop, phone, tablet. This isn’t an extra thing we provide. It’s just part of the web now, and we won’t build a site without it. Visually, we work to strike the right tone. Walking into law office is not the same as walking into a brew pub, and the visual tone of the site should reinforce your brand, which in turn should reflect what you are all about. If your brand is well established, we respect that as we build. But we are happy to start from scratch too and help you create a new brand first. Who wants to visit a slow website? What’s worse, who wants to go to a heavy website that burns through your mobile data plan? People tend not to wait too long for a website to load on a phone (and remember how much traffic is mobile these days). We build our websites to be as fast and lean as possible. With our hand-crafted approach to web development, your website isn’t a maze of bolted on plugins that allow it to be 1,000 different types of websites, or that is loading tons of code that never gets used. Instead, it’s build specifically for you, which means we can get rid of anything you don’t need, making it run as lean and fast as possible. We make sure your sites automatically compress and resize images, and cache as much as possible to ensure great speed and performance. We’re not the only ones that love fast websites — search engines love them too!